The carnage in the Equity, Gold, Real Estate and even the Debt markets have shattered investors faith. 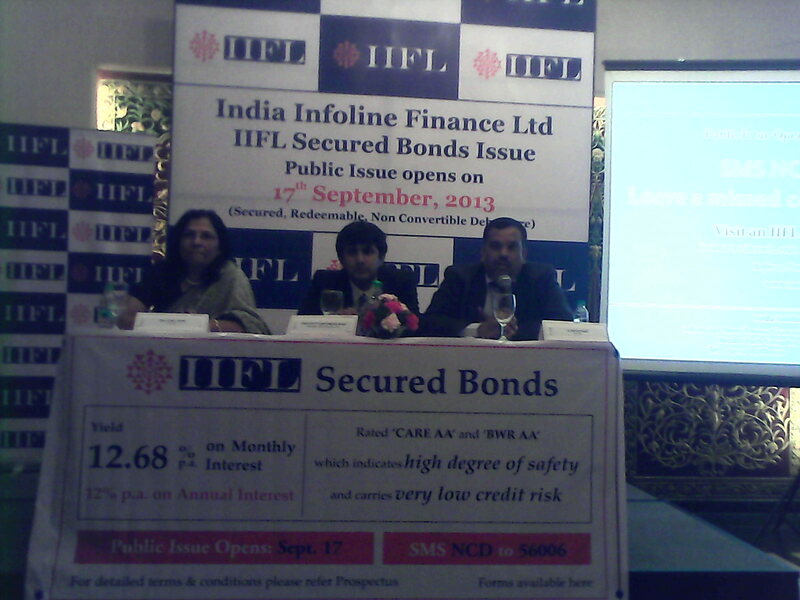 They are now looking at "fixed" returns and to cash in on the same, India Infoline Limited's NBFC subsidiary, India Infoline Finance Limited (IIFL) has launched a Public Issue of Secured Redeemable Non-Convertible Debentures (NCD) of Face Value of Rs.1000/- each aggregating to a total of Rs.1050 crores today. The NCD will carry a coupon rate of 12% interest annually. The face value of each NCD is Rs 1,000 and the minimum application amount is Rs 5,000 (5 NCDs). The NCDs have an investment horizon of 3 years and 5 years. Allotment is on a first-come-first-served basis except on the last day where, in case of an oversubscription, the allotment would be made on a proportionate basis. The issue will close on October 4, 2013. Investment can be made for a period of 3 years and 5 years. 1. This issue, unlike its 2012 avatar, is SECURED. So, in case of company going bust, your money is SAFE. Consequently, the claims of NCD holders will be superior to the claims of unsecured creditors (like company FD holders, which are unsecured deposits). The NCD is secured and shall rank pari passi with other credit holders. Even Banks and Company FDs do not offer this safety. 2. Rating too has gone up to "AA" from CARE, implying high degree of safety. 4. Good Liquidity due to listing of the NCD in both NSE and BSE. Though, NCDs are not traded regularly, IIFL's previous NCDs have good trading interest. 5. Monthly interest payment available, wherein annual yield works to 12.68%. 6. Company cannot prematurely redeem the NCDs as there is NO Call and Put option. 7. Company is in excellent financial condition and has among the lowest NPA in the industry. In fact, the NPA is progressively getting lower and lower from 0.36% in FY11 to 0.17% in FY13. 8. If you sell at the stock exchange after 12 months, your gains will be treated as long-term capital gain and will be taxed at 10 per cent without indexation. If you sell in less than 12 months, your gains will be treated as short-term capital gains and taxed at the marginal income tax rate. 1. For someone in the highest tax bracket, the yield will reduce to a paltry 8.4% from a lucuratively attractive 12%. They are better off investing in Tax Free Bonds of HUDCO which opens on the same day. However, please note that IIFL is for a maximum of 5 years, whereas HUDCO Tax Free bonds, your money could be locked for 10,15, 20 years. If you are a HNI and fall in the Highest Tax Bracket, you can skip the issue and look at HUDCO Tax Free bonds. If you are a retail investor then, you may go for the Bonds in moderation. Senior Citizens too can take advantage of the high interest and lock in at these rates and are advised to go for Monthly Interest Option. Unless you have a monthly commitment or are sure of reinvesting the Monthly interest you receive, I strongly advocate investors to go for Annual Option. Even for a risk-averse saver bitten by ever falling Bank FD rates, NCDs are great alternative. After all, a three-year fixed deposit will earn you 9-9.5% interest, but a three-year NCD will fetch 12%, a clear gap of 250-300 basis points. Investors can definitely take up the offer as they not only offer Returns higher than Bank FDs but their money is also secured by the Assets of the Compnay. The markets are volatile, be it Equity, Gold, Debt, Real Estate. And among Fixed instruments, IIFL NCD is an attractive offer which retail investors should seriously consider investing. Not only will you be locking your returns at a higher rate than a Bank FD but also liquidity is easy due to its trading in the Stock Markets!!! If you want to get out, you can get out any time.